For instance, you might want to use a rarely used app in the future, App Freezer then presents you the opportunity to restore (unfreeze) such app without losing any of the previously saved information. Insufficient storage space causes some apps to malfunction, or stop working completely. For example, WhatsApp, SMS app, Email app might stop receiving messages since there is no storage space to receive such messages. Similarly, the camera app might not respond because of the same insufficient storage space. Storage is one of the top smartphone features you need to have in place to get maximum satisfaction from your device. The major concern here is how to use the app in managing storage space, whilst not completely uninstalling apps that might be relevant later. So, what’s the Infinix App Freezer all About? The Infinix App Freezer is one of the preinstalled XOS Chameleon OS family apps included to allow users to take total control over how applications utilise the available storage space on their smartphones. 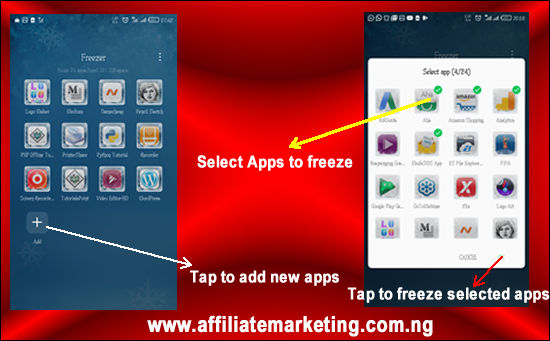 Infinix users would be familiar with this app and its somewhat function of prompting users to tap OK to freeze automatically selected apps. 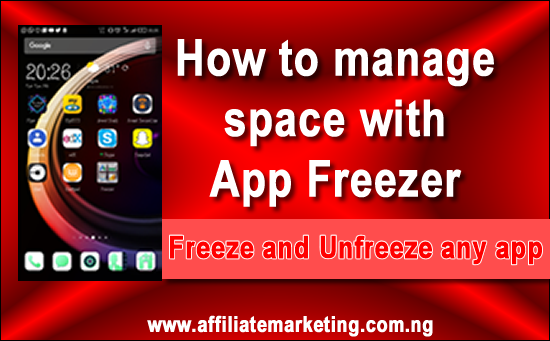 This app freezer is an extremely useful tool that ensures that apps don’t consume space unnecessarily on your device. Its ability to manage how apps use space on devices stands atop the relevance of this app. You can save quite a good amount of storage space by simply enabling this app, and freezing some applications. Frozen apps appear to be uninstalled from your device, and as such cannot be launched. 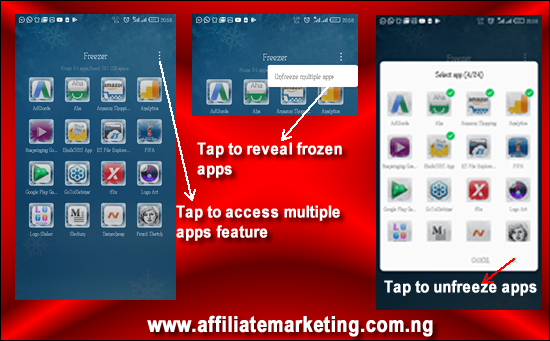 However, you don’t need to download or reinstall any of the frozen apps when next you want to use any of them. You must understand that any app you have frozen cannot be used or launched while being frozen. Literally, the app is no longer on your phone, and of course, you can’t use an app that is not installed on your phone. Though you can unfreeze any app anytime, it is wise to select the apps you want to freeze carefully so that you will not need to keep freezing and unfreezing applications every now and then. Now that are at grasp with what this useful app is about, it’s time to take a dive into freezing apps to save space on your phone for other relevant apps. To freeze apps, you need to first launch the App Freezer. You can access this app on the home screen, search it up or among find it among the XOS family apps’ folder. Let me remind you that you will not be able to use apps you have frozen. So, be careful not to select apps you regularly use, though you can unfreeze such apps. Now, while on the app freezer interface, tap the plus “+” or Add button. Go on to select as many applications you want to freeze by tapping each one of them. After selecting the apps you intend to freeze, tap OK.
At times, you might want to re-use an app you finally consider to be relevant. In that case, you must unfreeze the app, if it was frozen. How do you do that? I will describe in simple steps how to unfreeze an app or multiple apps. Find and launch the App Freezer by tapping the icon. While on the App Freezer interface, tap the three vertical dots at the top right corner of the interface. This will reveal an option for multiple selections. Now, tap Unfreeze multiple apps to access the interface for selecting the app(s) you want to unfreeze. Select the apps by tapping the respective icons. When you’re through with selecting your preferred icons, tap OK to unfreeze the app(s). In case you changed your mind and do not want to unfreeze an app any longer, simply tap Cancel to revert the action. The app relies on how you use apps on your device over a period to determine its relevance to you. Periodically, it serves up a request for users to simply tap OK to freeze a few selected apps. The selected apps are those that the user has not launched for a long time and as such have been deemed irrelevant by the App Freezer. In this case, you will need to be watchful as relevance seems to be decided differently by both you and the app. You might use a banking app once in a month making it appear irrelevant to the App Freezer. So, when there is a prompt requesting you to freeze certain apps, endeavour to go through the suggested apps and be sure that they are not relevant before tapping OK.
You can choose to deselect some of the apps or all of them by tapping Cancel. Tapping OK will cause the freezer to freeze all the selected applications. 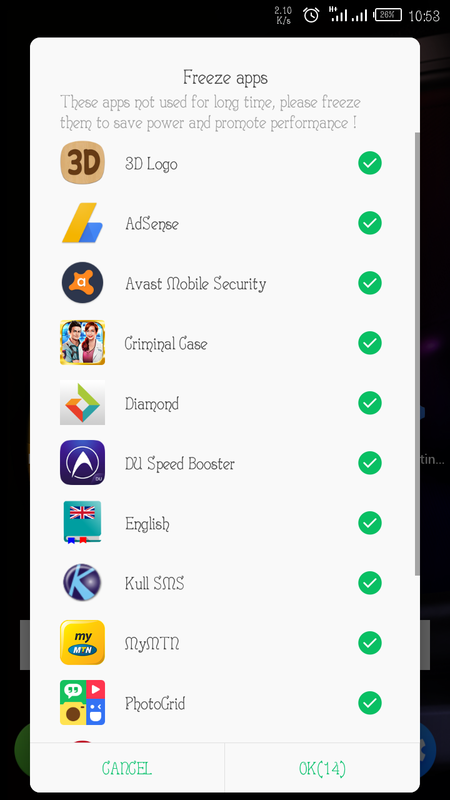 I have had to provide a solution to a seemingly unique problem among Infinix users as regarding the use of this app. Some have often stated that the app suddenly disappears, making it difficult to unfreeze relevant apps they have mistakenly frozen. Similarly, freezing apps manually becomes impossible. The only chance available is to freeze apps when there is a prompt from the App Freezer. Efforts to search for the app on the device have often resulted to nothing positive. The problem here is that the app has been disabled or a custom launcher is being used on the device. Any of the two stated reasons could be responsible for the app to disappears. Well, there is a green light out of this. I have recently published a post describing how to unhide or enable the App Freezer in a few steps. If you are facing this similar challenge, take time to read the post. Storage management can sometimes be challenging, especially when the storage devices – micro SD card, internal memory, etc. – are of smaller capacities. In such tight situations, one will need to frequently delete files, uninstall apps, clear app caches, among other things. Somehow, this is not comfortable to do because you might need several apps to run on your phone. Quite a few solutions exist, and freezing unused apps is one of such reliable ways that grants you the opportunity to manage space and equally utilise several applications on your device. Infinix App Freezer is a reliable tool you can use to properly manage enormous space on your device without losing important information on the apps you freeze.